Stacie Goffin is a widely recognized authority in early childhood education with a passion for raising the competence of this field of practice. She received a degree in child development from the University of Massachusetts Amherst followed by her Master’s in Early Childhood from George Washington University and her Executive Education Certification from Harvard. Stacie currently serves as the Principal of the Goffin Strategies Group where she uses her experience consulting with educational programs to improve effectiveness and services for young children. 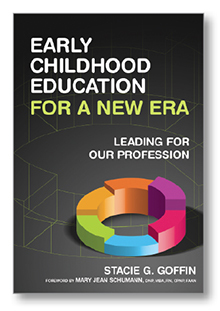 In her provocative new book, Stacie Goffin presents a leadership manifesto to the early education field: It should step forward as an agent for change by assuming responsibility for the competent practice of its practitioners and for facilitating positive results for children and their learning. As a field of practice, early childhood education should formally organize as a profession to realize consistency in practice across sites and program types. Goffin challenges the field to develop fieldwide leadership and diminish its reliance on public policy for defining its purpose and structure. Offering a fresh viewpoint on national efforts to improve program quality and children's learning and development, the book concludes with ''Next Steps Commentaries'' written by education luminaires Rolf Grafwallner, Jacqueline Jones, and Pamela J. Winton, outlining concrete action steps to jump-start the essential discussion about moving forward. Softbound, 120 pgs. For many years people have thought about how to bring more professional structure to the early childhood education field. 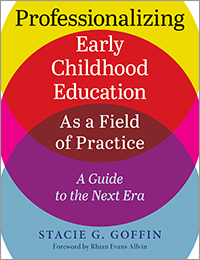 Professionalizing Early Childhood Education as a Field of Practice: A Guide to the Next Era is a tool to help everyone in early childhood education engage in serious discussions about professionalizing the field. Author and thought leader Stacie G. Goffin has written a book that contains an overview of the topic, a participant guide, a conversation workbook, and a facilitator guide. Each section supports deep thought and creative discussions about how early childhood education can move toward being a professional field of practice. The conversations from this book are intended to shape the field's future. Don't sit back and listen; be part of this important conversation.